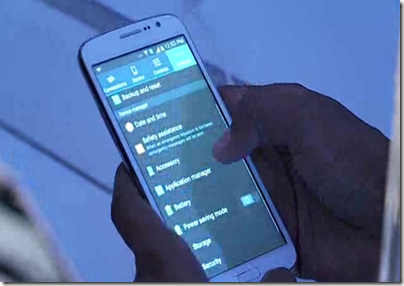 Samsung today launched its much awaited Samsung Galaxy Grand 2 (Quick Review) in India but did not mention the price. The launch event of Samsung Galaxy Grand 2 was streamed live and the price will be announced later in January when the faux leather back successor of Galaxy Grand is ready to hit the shelves. Samsung however revealed that price will be in the range 22,900 to 24,900 INR. The company also announced that the Device management and security feature, Knox seen in high end smartphones will also soon be available in Galaxy Grand 2. The phone is powered by 1.2 GHz Quad core processor and Samsung clarified that it is a Qualcomm processor but refrained from any further details. The RAM capacity assisting the CPU is 1.5 GB. The internal storage is 8 GB and can be further extended to 64 GB using MicroSD card. The Samsung Galaxy Grand 2 will come with Android 4.3 out of the box and you will get the subscription to “Club Samsung” free for first three months, which will let you download songs and other media files to your Samsung Galaxy Grand 2. The Display of this smartphone is 5.25 inches and the 720p HD display resolution will give you 280 pixels per inches, sufficient enough to enjoy you multimedia content on this large screen display. The primary camera at the back is of 8 MP and is capable of Full HD 1080P video recording at 30fps. The front camera of 1.9 MP is capable of high definition Video chat . The price of Samsung Galaxy Grand 2 will be available in January next year when it is available for purchase. 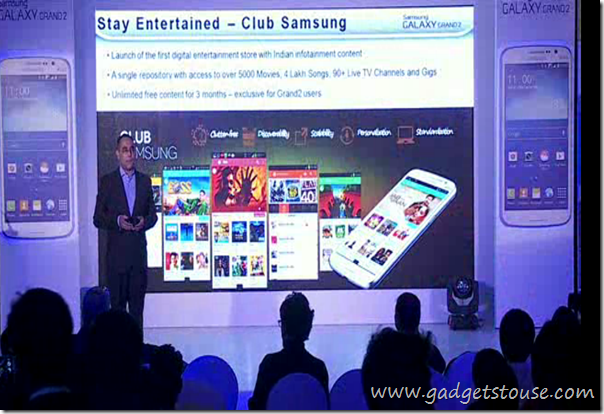 Samsung also vaguely mentioned that it will come up with exciting New Year offers in next couple of days. The phone will be available in White, Black and Pink colours.